Drop anywhere to begin upload! Upload your CV to get a free, instant estimate of your market salary. By uploading your CV, you confirm that you are over 13 and that your CV does not contain any special category data. We will analyse and store CVs in line with our Privacy Notice. You can delete CVs at any time. Get your CV battle ready! 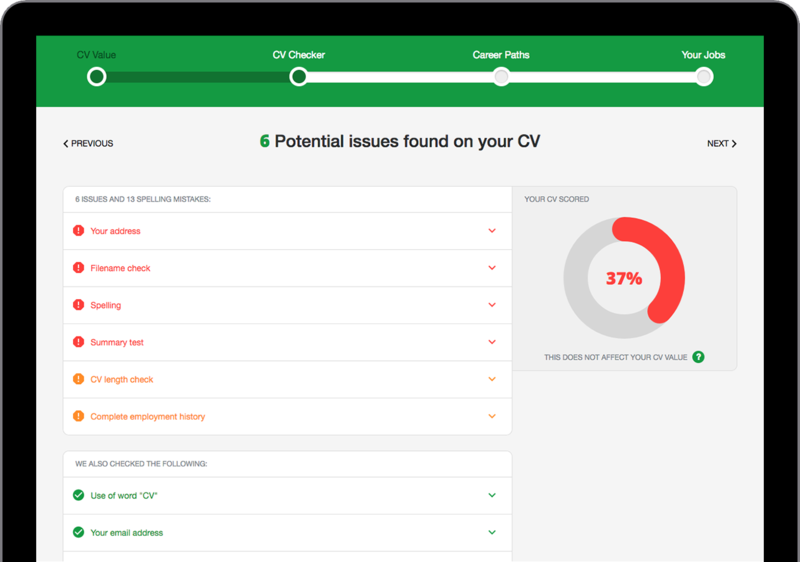 ValueMyCV automatically checks your CV for common mistakes to help get you that interview. "This valuation has changed the way I was looking at my CV. I feel more confident now to apply for jobs that I thought were too specialised for me." Our algorithm, trained on hundreds of thousands of CVs, matches your skills and experience with new career options. "The result from ValueMyCV is spot-on to my own estimated target salary based on my experience, skills and education. It is great to have a bit of reassurance that the package I seek is reasonable in the market." 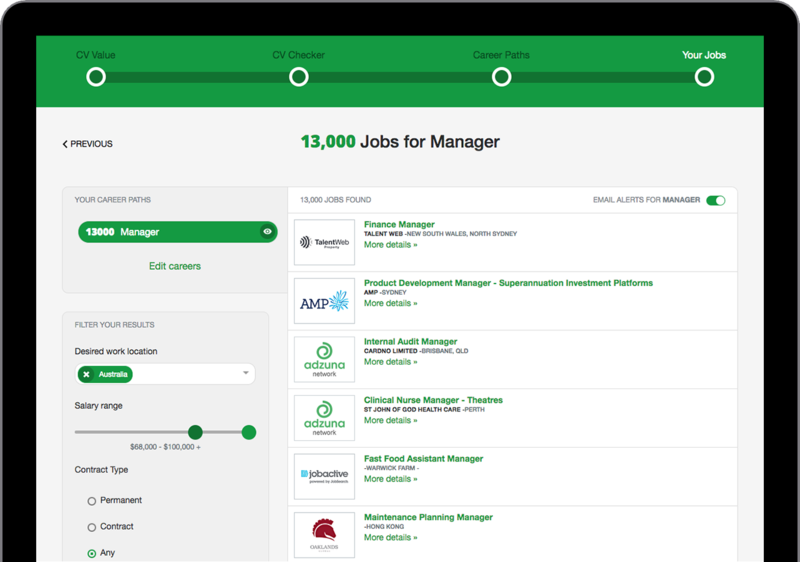 We search thousands of websites and bring together over 1M live jobs in one simple search. Upload your CV for free today! We analysed over 50,000 CVs and developed unique algorithms to model the complex patterns in the data. We take your CV and use text mining to extract a wide range of information including your work history, education and skills. We run this information through our algorithms and... bingo! You get a statistical estimate of your market value. We want to keep improving ValueMyCV. Please give us feedback on any features you'd like to see and we'll do our best to make it happen! Send me job alerts based on my CV? We're very sorry but the file you are trying to upload is not one we can parse and analyse. 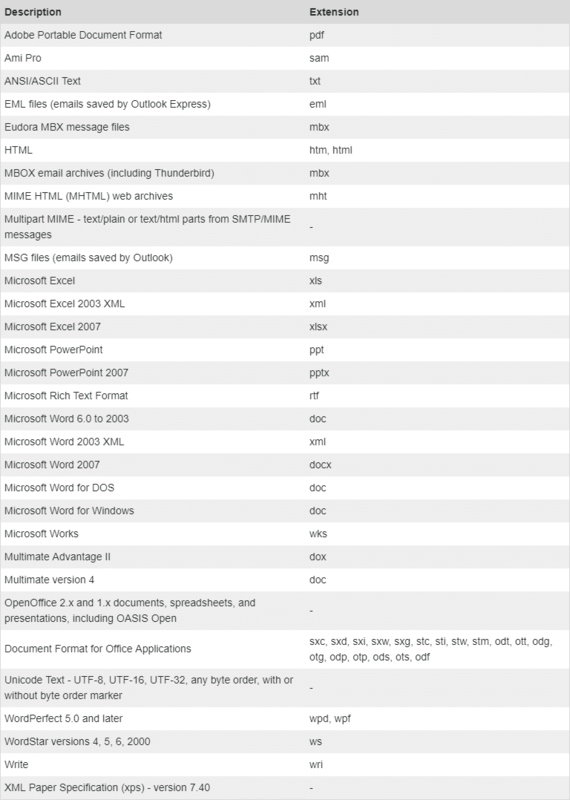 Please examine the list of supported formats for more information. We're very sorry but we're unable to value your CV at this time. Are you sure you uploaded a CV? Our analysis suggests that the CV you uploaded was either very short or very long. We were unable to analyse it further. Please contact us if you think we've made a mistake or try again with another CV. We're very sorry but the file you are trying to upload is too large. Please upload a smaller CV. We're very sorry but ValueMyCV is very popular at the moment and performing more slowly than usual. with all our wonderful analysis once it is complete. (check your spam folder just in case). Sorry, we haven't been able to identify enough information in your CV to value it. This may be because your CV is an image without any searchable text. This might happen if your CV is a scanned document, for example. You should check that you can select and highlight individual words. If your CV has searchable text and you are still seeing this message, then you should also check that you've included enough detail in your CV, such as specific skills gained in previous roles. You've tried accessing a CV valuation which is not associated with your account. and we'll try to resolve this issue as soon as possible. 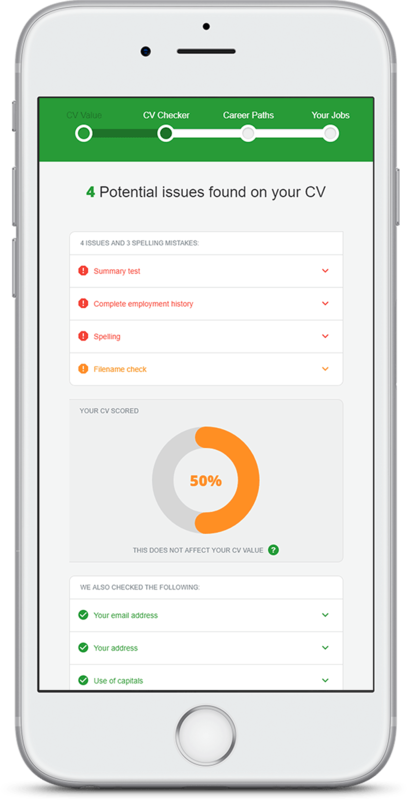 We’ve made a bunch of improvements to ValueMyCV. Upload a new CV to see what we’ve changed.